The Lakers may reign supreme�but we can't help but notice some other guys seated courtside. Look for David Beckham, Leo DiCaprio and Zac Efron cheering on, and just try to keep your eye on the ball. Fanatic Fact: Franchise scoring leader is Marcel Dionne who scored 550 goals and 757 assists for 1307 points in 921 games for the Kings. 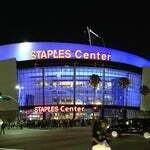 Some of Los Angeles� biggest events happen here, including the Grammy awards. Andy got to experience the stars up close and personal on the red carpet last year! Look out for his short shorts. Watch Grammy Night LIVE on VH1.com starting Sunday 6/5C! In the post-game melee after the Lakers' championship, a taxi cab was torched. 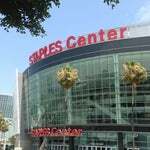 Staples Center owner AEG gave the driver $10,000 in compensation. You're so LA. 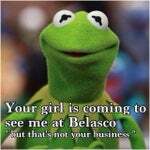 You go to the hottest ticket in town. Make sure to wear your purple and gold and cheer on Kobe as he goes for #6! Time to break out that bike to the Staples Center! Bike racks are available in the East garage located at W. Olympic Boulevard and Francisco Street. Outside the arena are statues of Wayne Gretzky and Magic Johnson, although both sports legends played at The Forum, where the Kings, Lakers and Sparks previously played. 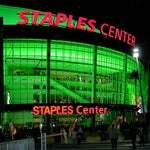 Back on 1/22/06, a baller by the name of �Kobe Bean Bryant� dropped 81 points up in here. We LOVE Hyde Lounge inside Staples! Perfect hideaway in a totally busy place. Hyde Lounge inside Staples is amazing! This is where we won our first-ever Stanley Cup on June 11, 2012 by shellacking the New Jersey Devils 6-1. A good time was had by all. 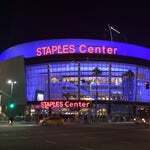 On July 7, 2009, Ustream (a 2011 Most Innovative Company) broadcast Michael Jackson's memorial service live from this arena. The feed lured a record-high 4.6 million viewers. 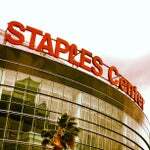 Did you know that X Games holds the 2nd most memorable event in Staples Center history with Pastrana's double backflip? 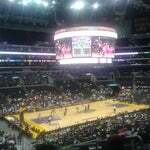 Sit on the floor for a Lakers game. Worth it! park a few blocks away and save a lot of money! Home to Music's Biggest Night for the past 9 years! Follow @theGRAMMYs to stay updated on all things music! 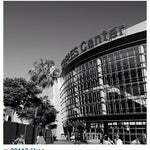 The home of the Lakers, Clippers, Kings and Sparks. 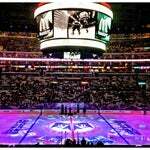 The epicenter of Los Angeles sports from November-June. Welcome to Lob City. 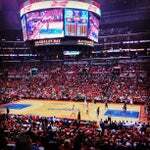 When the Clippers hold court here, prepare for lift-off. 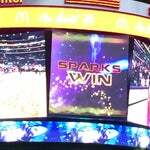 Lakers courtside seats are treated like heirlooms and never become publicly available. If you don�t already own them, you never will. 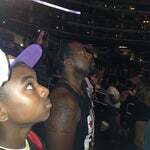 Despite urban legend, they don't save courtside seats for celebs. 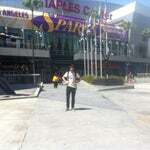 My first Grammys ever were here at The Staples Center!!! I was super sick and still performing, but I can still feel the excitement today! 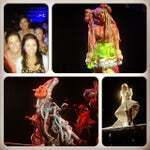 What a night!! 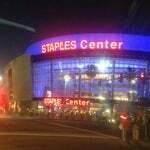 Staples Center has hosted NBA Championships, Stanley Cup Finals as well as concerts & boxing. 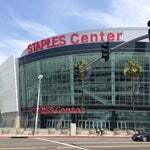 But when Arizona & Ohio St. tip off, it will be the first NCAA Tournament game in this building's history. 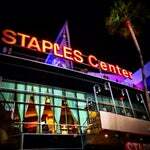 Performing at the Staples Center on March 12th!! I�ve seen some of the best shows here! You gotta hit up the Hyde Lounge on Level C after the show! !